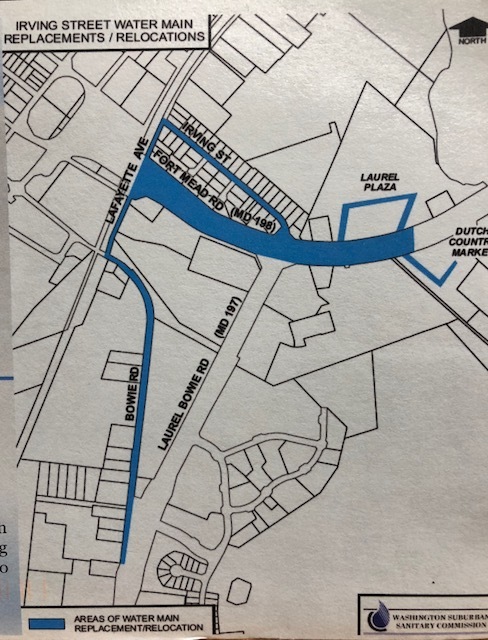 The Washington Suburban Sanitary Commission (WSSC) will begin replacing nearly two miles of aging water and sewer mains in the Laurel area this fall. Construction will last about 1 year and 2 months. WSSC Information Meeting to explain the Irving Street Water Main Replacement Project. 7:00 p.m. to 8 p.m. The map below shows the areas where water mains will be replaced marked in Blue.